Dr. Andy Eisen is a Las Vegas native who has built a multi-faceted career taking on challenges as a doctor, educator and state legislator. Most recently, he has been president of the Clark County Medical Society, and on Jan. 4 he began a new role as chief academic officer at Valley Health System. As valedictorian of his class at Chaparral High School, Dr. Eisen recalls, “Frankly, I was concerned at the time about the quality of the education I could receive here.” He went to Northwestern University where he received his bachelor’s degree in the science of medicine and his M.D. “I couldn’t do a residency in Nevada because there was no residency pediatrics here,” Eisen said. Instead, he did his residency at Phoenix Children’s Hospital. 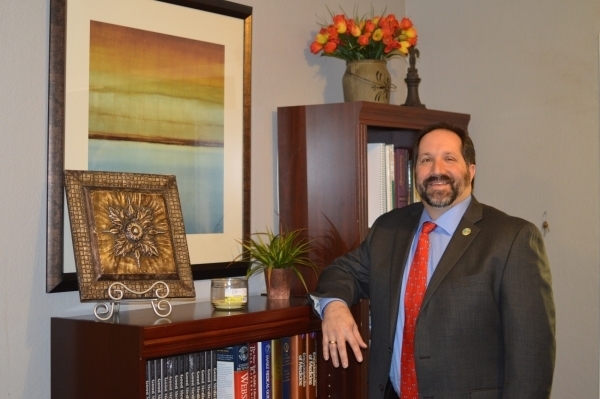 “When I finished my residency, it was really time to put my money where my mouth was and I was concerned about that opportunities here both at the medical school level and the residency level.” Dr. Eisen went to work with the University of Nevada School of Medicine to assist in getting the accreditation the program needed. Dr. Eisen has watched the medical education system grow, and says, “I think it’s really important to distinguish quality of care and access to care.” Access has been the biggest challenge, he said. But Dr. Eisen says better days are at hand. “The development of that medical education culture, which really hadn’t existed here in the last century, is changing the landscape,” he said. Q. When and how did you get involved with the Touro School of Medicine and in what role? A. I came to Touro in October of 2006, just as that first class was starting their clinical training. The role I took on, which is the role which I still hold, is associate dean for clinical education. So when the students are actually out in the community, under the supervision of licensed physicians, they’re actually in contact with real patients. We built the program, really, from the ground up. We’ve gotten great feedback from our accrediting agencies. Actually, in our most recent visit, the visiting team offered a commendation for our area, for clinical education based on the work we had done. Q. How have medical school options in Nevada improved? A. What was important to me was to rectify the concerns that I had. I feel very differently about the medical school opportunities here for students; it wasn’t something that was a consideration for me. I think the quality of medical education has risen tremendously, both at the University of Nevada School of Medicine, and Touro. Obviously, we have UNLV and Roseman that are going to be opening in the next couple of years. I think the opportunities for undergraduate students to want to go into medical school and stay in Nevada are tremendous. They’re going to continue to get better. Q. Explain the role of chief academic officer you have taken on. A. We’re going to be building residency programs across the entire Valley Health System. Right now Valley has five hospitals in Southern Nevada. In less than a year, we’ll open a sixth. The Valley Hospitals are Valley Hospital, Desert Springs Hospital, Spring Valley Hospital, Summerlin Hospital and Centennial Hills Hospital. The Henderson Hospital is going to be opening next October. I report directly to Karla Perez as regional vice president, and my office is literally right down the hall from hers. This is very much a system-wide activity, and it’s something to which the Valley Health System is committed. It’s not an inexpensive proposition to get residency programs up and running. The system has committed itself to doing that for a number of reasons I think are very important. There are going to be programs across the hospital, some of them more heavily located at one hospital versus another, and others will see residents spending time at multiple hospitals. It depends on what the disciplines are, what the services are at the various hospitals, what the learning opportunities are at various hospitals. Q. Are you still associated with Sunrise Hospital? A. I continue to be associated with Sunrise Hospital. I’ve been a member of the medical staff at Sunrise Hospital since 1997. I just renewed my staff privileges at Sunrise a couple of months ago. When we built the pediatric residency, we were the first residency program at the University of Nevada School of Medicine in a hospital other than UMC. Q. What has been your experience as a physician in transferring patients to higher level of care facilities such as UCLA, Cedar Sinai or Mayo Clinic? A. I’ve had a handful of times where we’ve had to transfer patients out of the area. Primarily they were for services that are very highly specialized or not offered at every center around the country. I’ve had pediatric patients who required a liver transplant. There are a handful of pediatric liver transplant programs in the country, so we had to transfer a patient out. Whether that’s something we’re going to build here in Southern Nevada in the near future, I don’t know. It’s not something that comes up all that often. It’s not either efficient or effective to do. The Medical Society is attempting — and has attempted to do over the course of our history — to elevate the quality of care, elevate the expectations of ethical behavior, of high-quality care that’s delivered to patients. Q. How do you define your time and your role in the State Legislature? A. I represented Assembly District 21 from 2012 to 2014. I served on the Assembly committees on health and human services, on education, and on Ways and Means. It was an incredible learning experience. We accomplished some good things, some important things. It’s small steps. The State of Nevada is a large vessel that does not turn quickly. Q. What shocked you most as a state legislator? A. One of the things — and this will stick with me forever — that I learned is that the people who are in the prison industry, people who build prisons, the way they determine where to build prisons is based on third-grade performance. So, if you have students who are way behind, who are not at grade level by the end of the third grade, that is a predictor for these companies; that’s where you build a prison. And the inverse of that — which I think is tremendously important message to take home — is that if you invest, a relatively small investment, in those kids early on to make sure they’re at grade level, particularly with reading, by the end of third grade, your need to build more prisons goes down. And the tremendous costs are not just financial but societal costs.